The Junior STEM Academy immersed students in science, technology, engineering and mathematics (STEM) topics in health and other sciences. Aug. 23, 2018 | Whether an undergraduate student looking for extra prep for medical school entrance exams, a young learner from an underprivileged or underrepresented background or a high school student wanting to spend the summer conducting research, chances are there was a camp or workshop available through the UAMS Center for Diversity Affairs. Multiple summertime forums and symposiums brought hundreds of students — from kindergarteners all the way to college undergraduates — to UAMS. Disadvantaged and underrepresented high school students interested in health care careers spent six weeks on campus preparing for the ACT with teachers and counselors, and also received introductory information on possible career options. The UAMS Academy of Pre-Health Scholars Program offered four weeks of ACT prep work and two weeks spent exploring medical professions. Two separate workshops — Final MCAT Program and Pre-Medical Summer Scholars Program — targeted undergraduate and graduate college students and others interested in medical professions by preparing them for the Medical College Admission Test, or MCAT. The Summer Scholars Program gave participants an intensive, six-week course while the Final MCAT Program offered an abbreviated, but vigorous, 12-day session. UAMS medical students helped facilitate both workshops. High school and college students in the Summer Research Internship Program spent their breaks in the laboratories working alongside UAMS scientists. The program pairs students from minority, marginalized and disadvantaged groups with a UAMS faculty member for a nine-week period. The students experience and work in the lab and sit in on lectures, seminars and workshops. “The summer program exposes students to research in an attempt to not only expand their knowledge, but to increase their awareness of career options as well as establish a mentor relationship,” said Billy Thomas, M.D., M.P.H., vice chancellor for diversity and inclusion. The Center for Diversity Affairs’ programs were not all geared toward older students. The younger generation had their chance to learn in the Junior STEM Academy. The two-week program immersed students in science, technology, engineering and mathematics (STEM) topics in health and other sciences. Each day, the students became a different doctor. One day, they were cardiologists treating a patient with a clogged artery; the next they were geneticists observing the difference between genotype and phenotype and learning the different blood types and how those blood types are donated; then, they were primary care physicians treating cuts and abrasions; and they were pulmonologists monitoring oxygen and carbon dioxide levels during workouts and developing exercise regimens based on their data. The tracks were split into two age groups, kindergarten through third grade and fourth grade through sixth grade. Each day brought hands-on activities to drive learning and understanding. About 120 from three states attended. A few were invited to tag along June 19 with UAMS Chancellor Cam Patterson, M.D., MBA, and Thomas at a check presentation with Bank of America. 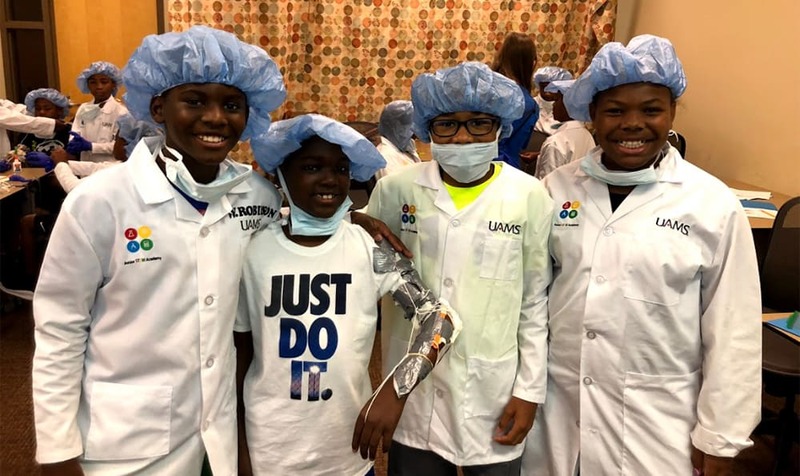 Bank of America donated $24,000 to UAMS, including $20,500 reserved for the Center for Diversity Affairs’ summer programs like Junior STEM Academy. Booth said the program also received tremendous support from parents, local businesses like Larry’s Pizza and Jimmy’s Serious Sandwiches, as well as UAMS Nutrition Services. In addition, many UAMS employees donated lunches, supplies and money. While so many summer events make for busy schedules, the impact is evident and well worth it, said Thomas.